1. Vide RBE No. 77/ 2016 [Estt. Rule No. 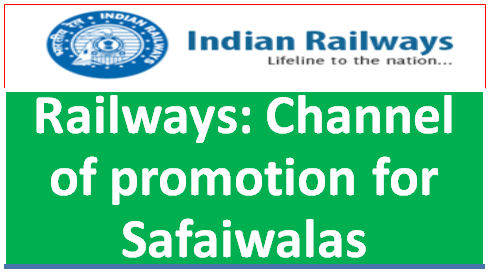 100/2016), Board have issued various recommendations in regard to providing channel of promotion for Safaiwalas. 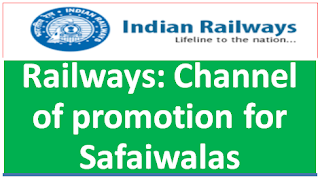 2.1 In all the technical departments, Safaiwalas should be included in the cadre of Helper/ Khalasis after 5 years of service assigning them bottom seniority, and be made eligible for further promotion as Technician Gr. III in G P Rs. 1900 (Level-1) as per seniority/ suitability and their qualifications. 2.2 As per Para 167 A of IREM -I, the posts of Field Workers (GP 1900) in Medical department are to be filled up through 50% DPQ from Gr.- D staff in Family Welfare Organisation. It has been decided that Safaiwalas of Medical department having required eligibility should be included with other eligible staff in the AVC of Field Worker against 50% DPQ. Office Clerk of all departments against 16-2/3% quota for promotion from erstwhile Gr.-D to G r.-C posts. Ticket Collector against 16-2/3% quota for promotion from erstwhile Gr.-D to Gr.-C posts. Accounts Clerk against 8-1/3% quota for promotion from erstwhile G r.- D to Gr.­ C posts. Motor Vehicle Driver in all departments subject to passing selection/suitability test/trade-test and possession of Driving License and required educational qualification prescribed for the post. 3. The above instructions should be strictly adhered to. This has the approval of PCPO.